It all began with two guys who loved singing a cappella harmony. But they just wished they didn't have to drive so far to do it. Jon and Arbe were Temecula Valley residents who drove the 160-mile-round-trip each week to sing with the Masters of Harmony in Santa Fe Springs. Not a bad group to sing barbershop with, but what if the boys could make some of that music right in their own backyard? The crazy scheme of starting a local chapter of the Barbershop Harmony Society was hatched. Shortly thereafter, rehearsals began with Jon and Arbe lending some of the craft they learned from the Masters. 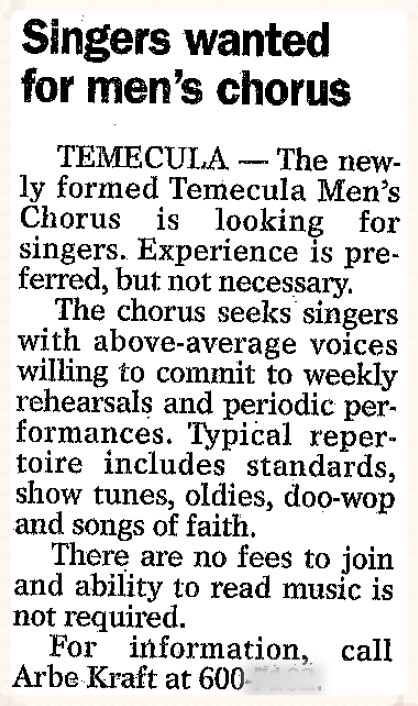 And Temecula's Wine Valley has been filled with harmony ever since. Of course, it helps that our director has a musical name, but more importantly, he loves making music. Sang is passionate about uniting voices in song - whether it be at his daytime gig as the Choral Director and guitar instructor at Great Oak High School in Temecula or at his Wednesday night guilty pleasure of leading the Wine Valley Harmonizers in the fine art of acappella harmonies. Sang Park has classical music training and degrees and stuff, but - more importantly - began his love for barbershop back in high school when he heard a performance by Metropolis, a quartet known for their music and their humor. Sang's enthusiasm for music and the chord-ringing of barbershop is infectious and effective. At the end of a rehearsal, expect to have enjoyed a night of being engaged, educated, and energized.